Unnalise Radley helped the stranded black marlin back into the sea. A woman in Australia became an unlikely wildlife rescuer when she helped a stranded marlin. The incident took place at Coral Bay in Western Australia on Monday. Unnalise Radley was at the Coral Beach when a marlin fish - a close relative of the swordfish - swam too close to the shore and beached itself. 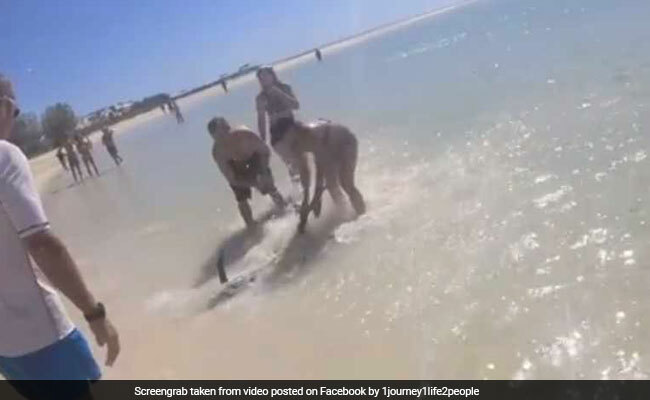 "I was actually filming it as it was swimming," Ms Radley said to The West Australian. "It was feeding then swam quickly to the shore and beached itself." When Ms Radley shouted for help and no one stepped up, she herself rushed towards the water and grabbed the black marlin. Soon, two other bystanders got up to help her. Together, the three managed to guide the big fish back into the sea. Footage of the rescue was captured and shared on Facebook by the blog, 1 Journey 1 Life 2 People. Ms Radley says she cut her hands trying to help the marlin, but didn't mind it. She tells The West Australian that she did not even notice the pain until after the fish swam safely away.